It is still hard for many of us to believe that Seamus Heaney is no longer with us; that this link in our chain of language has been broken. The scale of public mourning following his death confirmed him as not just our most beloved poet but our exemplary one. The warmth that radiated from his presence will now be absent from those occasions when poetry is celebrated. There was such sturdiness and steadfastness in his character that we came to see him as a kind of invincible life-force in poetry: ‘A pillar to himself and to his trade’, as he says of the ‘solid man’ in ‘Crossings’. Invincibility is not given to any of us of course, but at least it can be said that he was a revitalising force in Irish poetry – a rigorous and ebullient one in his command of the language. Those qualities are of course also the unshakeable hallmarks of the poetry he has left us, work that conforms to what Auden demanded of poetry, that it ‘must praise all that it can for being and for happening’. He answered that call to praise – and to scrutinise, elegise, eulogise, memorialise, express love – with a copious eloquence of language and an awesome ability to renew its lyric power, a gift that remained right up to the grace notes of his last collection with its sense of time passing. From its beginning, and since that resounding declaration of intent in ‘Digging’, the opening poem of his debut collection, the work has deepened in its ethical quest to find the right word, the perfect pitch. In both form and content, there is a Shakespearean amplitude to his body of work. In a tribute to Czeslaw Milosz, he once declared that what distinguished the Polish poet was ‘the abundance and spontaneity of the work, his at-homeness in so many different genres and landscapes’. 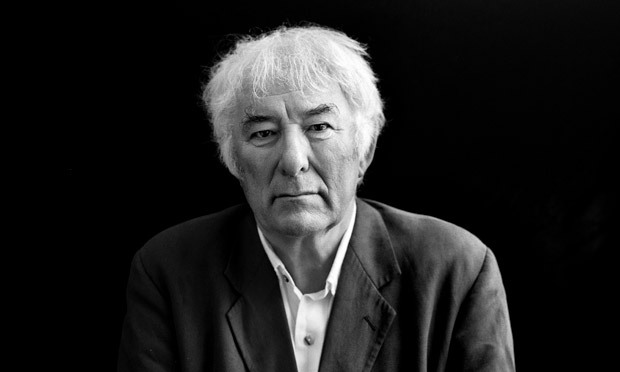 There is abundance in Heaney too, and that at-homeness is at the core of his poetry: an at-homeness in what he called ‘the heartland of the ordinary’, as well as in his ‘republic of conscience’; an at-homeness with the blacksmith and the thatcher as much as with a fellow laureate or a monarch. As celebrant of the ordinary, he was ‘obedient to the demands of memory’, knowing that it is the place where the true treasures are kept. Like Kavanagh he knew that loved places are important places and that to remain earthed in them, in memory and imagination, is a ‘method of getting at life’. He may have left his rural home ground of bog and potato drill, the homestead hearth and farmyard, at a young age – first departing for St Columb’s College and then crossing other frontiers – but that native Derry ground remained an abiding and fortifying presence in his imaginative life. No matter where the journey took him – to a station island, a Harvard classroom or the Nobel podium – he was always aware of ‘poetry’s need to descend from its high vantage point and creep among the nomads on the plain’. The familiar and the quotidian are made wondrous, place names – Anahorish, Moyola, Glanmore, Castledawson, Toomebridge, Mossbawn – blossomed on his pages. In the din of acclaim he never lost his clarity of perception, nor as a poet among poets his generosity of spirit. He gave us what he once said he looked for in Mandelstam, poetry ‘that is not only pleasurably right but compellingly wise’. The wisdom shows itself in his poems of response to the sectarian conflict in Northern Ireland – among these poems lie the greatest testament to his integrity as an artist; an integrity that ensured that in his own lifetime’s moment of ‘historical duress’ he remained loyal to his aesthetic values. Of all the genres which his virtuosity touched, the one he took and remoulded in a uniquely Heaneyesque way is the love poem, a form he sublimated with such poems as ‘The Skunk’, and in his last collection, ‘Chanson d’Aventure’, surely the first great love poem of this century. Seamus’s role extended beyond his literary eminence; in his Stepping Stones interviews with Dennis O’Driscoll he acknowledges that his calling as a poet put him ‘in line for a certain amount of community service’. Not since WB Yeats has a poet played such a role in national life – and public consciousness – where his authoritative voice always offered the redress and equilibrium that language so often needs in our age of doublespeak and inversion of truth. With courtesy, kindness, dignity, as well as a kind of supra stamina, he never wavered in face of this public expectation and the pressures on his time to say things about Ireland and the world. His loss to the language and to poetry is immense, but his absence from the lives of Marie and his children and grandchildren leaves a void we can barely begin to imagine. We will miss his companionship but take consolation in the companionship of his poetry: it will now fill the silence left behind after his death. There is a moment in Out of the Marvellous, the documentary made to mark his seventieth birthday, when Seamus is asked whether somewhere in his poems there are words that would suit as his epitaph. There is a brief hesitation before he quotes from Sophocles, Oedipus at Colonus – ‘Wherever that man went, he went gratefully’. But the gratitude is ours. Gerard Smyth's seventh collection, The Fullness of Time: New and Selected Poems (Dedalus Press) was published in 2010. He is a member of Aosdána and is current chair of the board of Poetry Ireland. He is co-editor, with Pat Boran, of If Ever You Go: A Map of Dublin in Poetry and Song, due to be published by Dedalus Press early next year, and which is Dublin’s One City One Book for 2014.